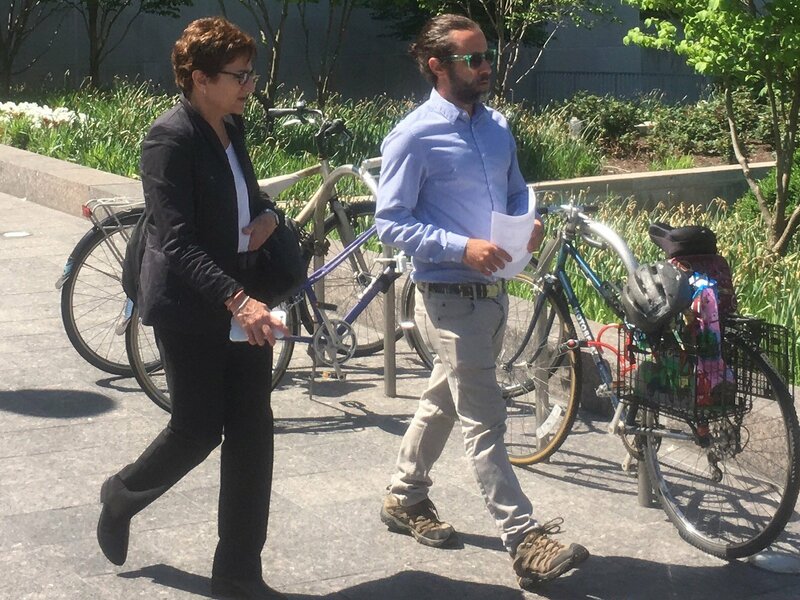 Washington, DC – After pleading guilty to several felonies in April, Dane Powell was sentenced to four months in federal prison by Judge Lynn Leibovitz in DC Superior Court today. He will do four months of a thirty-six month sentence with two years of supervised probation post-release. Powell had been facing a potential sentence of 140 years for allegedly breaking windows and throwing rocks at police while protesting Donald Trump’s inauguration as president on January 20. He was taken into custody by US marshals at the conclusion of the sentencing hearing. Before the hearing, supporters rallied outside the courthouse. The number of those in attendance led to the court opening an overflow room showing a video stream from the main courtroom. In an interview with It’s Going Down earlier this year, Dane explained his reasons for taking the plea. The boiler-plate indictment issued by the US Attorney’s DC office, which names Powell along with over 200 other defendants (most of whom have had no evidence presented against them) alleges anti-Trump inauguration demonstrators destroyed property valued at $100,000. Washington DC’s local government has already allocated a larger sum – $150,000 – to fund an official investigation into police misconduct on January 20. Observers from the DC Office of Police Complaints (OPC) have already issued a report stating that police attacked protesters, reporters, and bystanders (including OPC observers) violently and without warning. A few defendants have taken plea deals for lesser charges than those leveled against Powell, and received suspended sentences, probation, and community service. 135 have signed a statement of unity pledging not to cooperate with the government prosecution in any way. The vast majority pleaded not guilty in recent court hearings, with the first trial dates set for November 20 of this year. The superseding indictment and its additional felony charges are a means to coerce defendants into accepting plea deals against their will. The goal is not to convict people to 75 years in prison. The severity of the threat is intended to extract as many guilty pleas as possible, while sending a clear message to potential protesters that the consequences of opposition will be grave. These pleas are needed to vindicate the state’s narrative and legitimise their repression. The intention is to set a legal precedent for mass arrests in the era of constant crisis, so that future social movements can be smothered in the cradle. – Carlo Piantini, Why Am I Facing 75 Years in Prison? Washington, DC police are still facing a lawsuit from the American Civil Liberties for various incidents of brutality, sexual abuse, and civil rights violations carried out on inauguration day. Read more about ongoing J20 court proceedings here.